Adaptive technology holds great promise for sensorimotor rehabilitation in people suffering from spinal cord injury, neuromuscular disease and stroke. 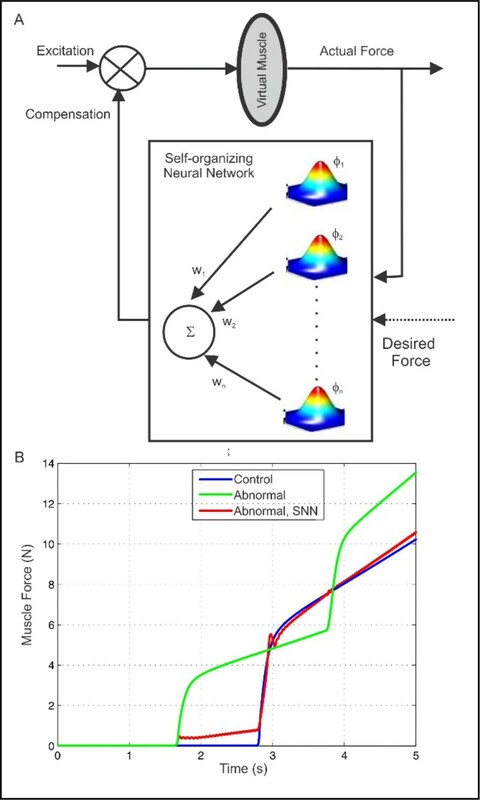 With a long-term goal of developing adaptive technology for diagnosis and rehabilitation of neuromuscular dysfunction, we begin the development of a self-organizing neural network (SNN) that compensates for reduced neural drive. We suggest that the self-organizing architecture that adds or deletes nodes online to generate suitable compensatory muscle excitation (Figure 1A) is an apt mechanism to emulate the motor pool behavior of recruitment and de-recruitment of motor units during muscle force generation. Using a virtual muscle  resembling the human biceps brachii, we demonstrate the augmentation of neural excitation by the SNN to compensate for abnormal muscle force due to change in the number of motor units. A. Schematic showing the virtual muscle-SNN system; Φ 1 , Φ 2 , .. Φ n are radial basis functions and w 1 , w 2 , ..w n are weights for summation. B. Simulation of normal (Slow-Fast motor unit ratio - 2:4), abnormal (Slow-Fast motor unit ratio - 3:3) muscle force and, compensation by SNN.